Slaughtneil players and supporters celebrate after defeating Banagher to retain their Derry senior hurling crown. Slaughtneil hurlers will turn their gaze to defending their Ulster title after claiming a sixth successive Fr. Collins Cup in front of 2,542 spectators at Owenbeg on Sunday. 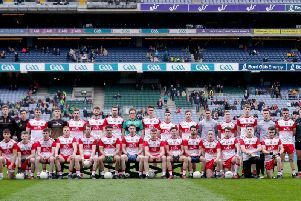 The Derry champions were never at their best in a scrappy game but goals in each half from Cormac O'Doherty and substitute Brain Cassidy mean't they were never unduly threatened by a Banagher side who lacked the scoring potential to trouble them despite a spirited display. A disjointed, scrappy first half began with O'Doherty's long range free being helped into his own net by Banagher's Brian Og McGilligan on two minutes to give his side a two point lead and that was as close as the underdogs ever got. Tiernan McCloskey, who top scored with 0-7 from frees, had opened the scoring for Banagher inside the first minute but it would be a further 22 minutes before the St. Mary's scored again when McGilligan brought it back to 1-04 to 0-2. However, a late rally that saw points for Tiernan McCloskey (2) and Darragh Cartin ensured Banagher were still within touching distance at 1-06 to 0-05 at half-time but Slaughtneil's extra class told after the break. With O'Doherty injured, Brian Cassidy was introduced during the break and it was his goal, tapping home with 10 minutes left after Meehaul McGrath's shot had been saved by Daryl McDermott, that made the game safe. That goal made it 2-12 to 0-8 after Cassidy, Chrissy McKaigue, Rodgers, Mark McGuigan and Se McGuigan had all pointed and from there, it was only a question of the margin of victory as Slaughtneil's gaze turns to a meeting with Down champions Ballycran. Banagher: Daryl McDermot: Gabriel Farran, Ruairi McCloskey, Shane Murphy; Darragh McCloskey, Mark Lynch, Niall Farran; Brian Og McGilligan, Sean McCullagh; Jack Phelan, Ciaran Lynch, Darragh Cartin; Tiernan McCloskey, Jonathan O'Dwyer, Shane Farren. Slaughtneil: Gareth O'Kane; Paul McNeil, Sean Cassidy, Paedar Kearney; Ruairi McCartney, Shane McGuigan, Conor McAllister; Gerald Bradley, Sean Cassidy; Christopher McKaigue, Meehaul McGrath, Mark McGuigan; Cormac O'Doherty, Se McGuigan, Liam Cassidy.